I expect that this year’s letter will be more than 140 characters. This is my rationalization for printing and mailing it for yet another year. And the fact that Chris bought 100 stamps last week, which would otherwise last our family a half decade if we didn’t use dozens for this annual mailing. Like every third year in the past, our family joined our China adoption group of five families for a combined summer vacation. This year it was an abbreviated trip to Chicago because all the girls’ busy sophomore high school schedules limited us. We visited the Navy Pier, Cloud Gate and Willis Tower among many other places. The Field Museum had Animal Body Worlds, so we got to see the plasticized veins and brains of horses. We (by that I mean just the girls) shopped the Magnificent Mile. The city apparently runs on parking fees. Three years from now the girls will have graduated from high school, so this was probably our last group vacation together. Over summer weekends, our family went canoeing, attempted archery at a local metropark and continued our tradition of picking apples in the fall. This time we were vigilant and were able to score the elusive Honey Crisp, which apparently have a picking season of about three hours around here. 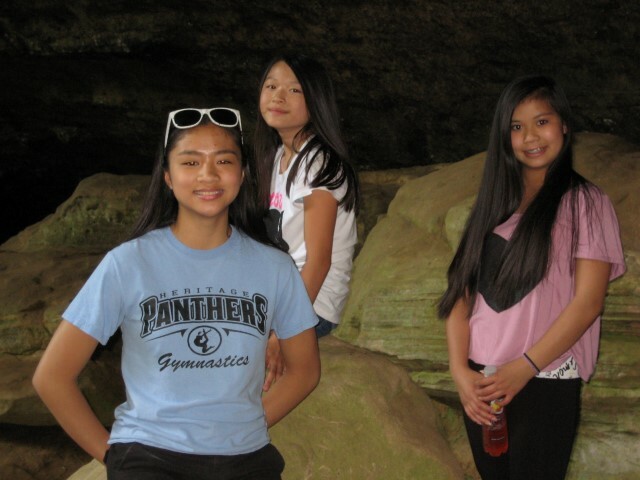 Chris also took the girls for a weekend cabining in the Hocking Hills. Having pre-teen and teenage girls, there were also seemingly monthly sleepovers in the neighborhood. At home we have new carpet in the house. I’m surprised my off white carpet lasted the twenty years that it did with kids running around. In the process our cat Misty went back to the humane society for re-adoption because she was one of the reasons we had to get new carpet. We wished her well. We still have Cooper who seems to have more self-control. 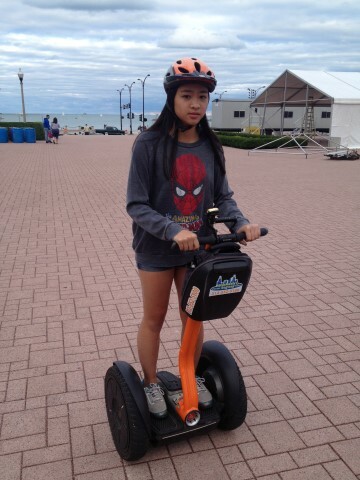 On our Chicago vacation, Marissa got to ride a Segway around the Buckingham Fountain and when we got home she acquired her temporary license for operating vehicles with four wheels. I now almost spend as much time in the passenger seat of my car as I do driving it. 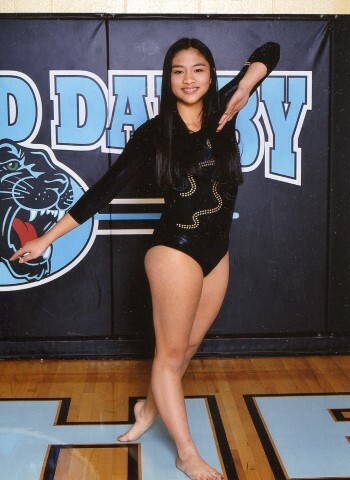 Marissa continues with her high school gymnastics; her 5-times-a-week practices are my motivation for having her capable of transporting herself starting in January. Up until it got cold in mid-November, she was biking to and from school. In between practices and homework, her vice appears to be watching endless Vine videos on her phone. Kaitlin had ankle surgery in July due to complications from a previous injury and was in a wheelchair for the Chicago vacation. Physical therapy still continues after nine months but at least she has been able to get back into the ice skating she loves. Shortly after school started, she had her wisdom teeth pulled. 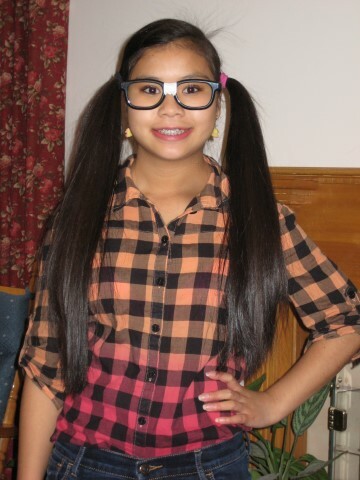 Even though she saw Bruno Mars in concert, I think she would have liked to have had a “do over” for this past year. She plans on getting her driving temps over Christmas break. I look forward to witnessing the negotiations between the girls as to who gets the car Friday night. Kaitlin’s vice appears to be Snapchat selfies and Twitter. Claire has replaced gymnastics lessons with volleyball and trombone. She doesn’t play them at the same time—at least not yet. 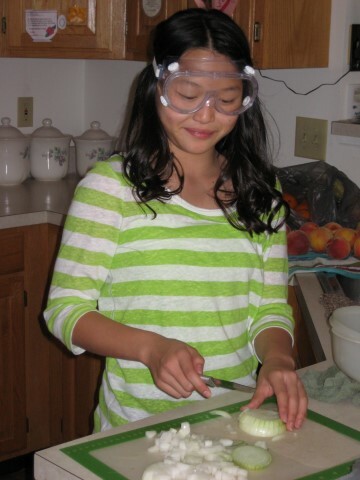 She’s also had an egg drop, a squid dissection and biweekly safety patrol this past year at school. With safety patrol, you get to monitor the halls for underclass vagrants and raise and lower the flag each day. Or, in Claire’s case, lose the flag to a gust of wind as it sails onto the school’s roof. I think they still do reading and arithmetic at school as well. Claire’s vice is Instagramming baked goods. Chris, probably in sympathy with Kaitlin, also had oral surgery. Hers was periodontal though. She and I briefly tried to out-pity each other because I had periodontal surgery as well years back. Chris came out the (ahem) winner because she had more than a dozen teeth taken care of. All in all, I counted 140 medical related appointments on the family wall calendar for 2013. I suspect next year will be less eventful because we’re healthier now. During the spring and summer I continue to bike. With Kaitlin’s ankle out of commission, I took Claire on the Great Ohio Bicycle Adventure with me. We had a blast and ended up stopping at many playgrounds along the weeklong route. And after a couple of years of aborted attempts, I completed the 210 miles of TOSRV the year I turned 50. It was a mid-life crisis thing. Saturday was great because I was able to hang with a couple of strangers half my age. Sunday was not so great because grandfathers and grandmothers were passing me on hills on the way back to Columbus. Next year, I plan on replacing my participation in TOSRV with the Pelotonia ride which is later in the year. The new ride raises funds for cancer research at The Ohio State University. I would be honored if you donated to my fundraising next year. I wish you all Happy Holidays and a healthy new year. Dental surgeries are on me. Ken, Chris, Marissa, Kaitlin, Claire and Cooper. I love hearing the updates on the girls I remember as babies! And am, of course, impressed with the tenacity of the cats and carpets…no doubt Chris is loving the bonds of motherhood, neighborhood and keeping new drivers safe from whatever’s under the hood as the girls are unleashed on Columbus and all things mobile! I just got the lovely Christmas card from Marcia and Steve and the kids and was able to introduce them to my new home (open for any Huffman excursions!) which includes 4 cats ( I hear Tim sneezing now….) and a recently erected Christmas tree….I read goba will hit Orrville again this year and would love to see you all if the time allows you to detour. Thanks so much for being so open with updates on your family. Mine are all fine and experiencing the same damnable dental issues….the only thing worse is a mouthful of nothing so I soldier on through the root canal/crown adventures in creative financing…I won the award for most cancellations for the year 2013….next year will be better—-thanks to Oral B! Love to all, Michelle p.s. hug Chris for me!